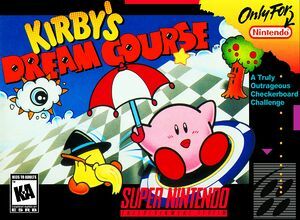 In Kirby's Dream Course scan the course and check out the obstacles ahead. Get ready for the most surprising game play imaginable in Kirby's battle against King Dedede! This checkboard challenge brings outrageous hazards and bizarre surfaces. Warp panels instantly transport you to new and exciting challenges. Conveyer belts provide higher levels of adventure. Turntables take the action in a whole new direction. Gordo, Kracko, Whispy Woods and a cast of zany characters await you. Gain special powers including Fireball, Freeze, Spark and Parasol. Transform your enemies into stars revealing eight hidden cups of each wildly different course. Control the force and angle of your shot and sink Kirby for a hole-in-one! The graph below charts the compatibility with Kirby's Dream Course since Dolphin's 2.0 release, listing revisions only where a compatibility change occurred. This page was last edited on 10 December 2017, at 22:10.